At Rock Steady Boxing/Belmars Gym, 5 Prospect Ave, White Plains, weekly classes are designed to help you in your fight against the progression of Parkinson's Disease (PD) symptoms. Reclaim your mind, body, and spirit by participating in research-based physical exercise that addresses the needs of individuals with PD. Empowering PD patients to fight back! Fight your way out of the corner and start to feel and function better through Rock Steady Boxing/Belmars Gym (RSB). We are Westchester's location-of-choice for people with PD who seek a tailored exercise routine that can improve their quality of life. Exercise limits the progression of PD symptoms, according to The Parkinson’s Outcomes Project. Research found that at least 2.5 hours of vigorous exercise per week can improve balance, flexibility, and other physical skills affected by PD. Our trained Rock Steady instructors can help you acquire the necessary tools to cope with both the motor- and nonmotor-symptoms of PD. Exercise is good for general health, but certain forms of activity can target specific Parkinson's symptoms. Parkinson’s affects many aspects of the brain and may result in balance issues, coordination problems and difficulty with movement. These factors are what boxing training aims to reduce. Boxing classes place emphasis on improving the body and brain’s functioning to soften the symptoms. Boxing works by moving your body in all planes of motion while you progress through the workout. Boxing classes have been proven to actually lessen PD symptoms, leading to a healthier/happier life. 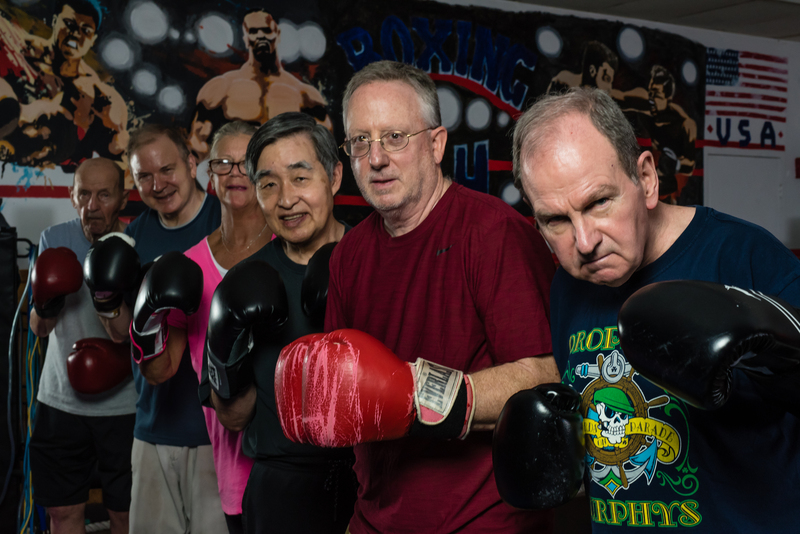 Rock Steady Boxing, the first boxing program of its kind in the country, was founded in 2006 by Indiana resident Scott C. Newman, who is living with Parkinson’s. Newman began intense, one-on-one, boxing training just a few years after he was diagnosed with early-onset Parkinson’s at the age of 40. He witnessed the dramatic improvement in his physical health, agility and daily functioning through boxing's intense and high energy workouts. Rock Steady Boxing is a unique exercise program based on training used by boxing pros that has been adapted to serve people with PD. The program includes exercises such as stretching and yoga. It supports motor skills through speed-walking, jumping rope, push-ups, balancing and lots of non-contact boxing. Led by experienced trainers/coaches. Rock Steady Boxing serves men and women of all ages and ability who have PD. Classes are strictly non-contact and individually tailored. Modification of exercises addresses the needs of a variety of participant skill-levels. Boxers are encouraged to do "what they can do" to finish each class. Recent studies have shown short-term and long-term improvements in gait/walking, balance, performance of daily activities and quality of life in those with PD who box regularly. Certain types of exercises are believed by the medical community to be neuroprotective and slow disease progression. The brain’s own way to adapt to changes caused by illness, injury or the environment is called neuroplasticity. It is a natural re-education of the neurons to modify messages received by the brain. Learning new exercises, like learning a new language or trying new puzzles, are valuable techniques used by those who are aging as well as those with neurological conditions like Parkinson’s. Rock Steady takes outcome measures at various intervals during the training program. We can help you live a more productive and rewarding life while limiting the progression of PD symptoms. We can help you get your life back on track. Prospective participants are invited to observe a class at no cost in real-time. Next, an appointment for an assessment is scheduled before classes start.The one-time cost for the 60- minute assessment is $40. At the time of assessment, you may choose to take from 8 to 12 sessions monthly. Each session is 90 minutes. Take advantage of the Rock Steady Boxing/Belmars program. It can support your individual fight against Parkinson’s. Our facility is located on Prospect Ave, accessible from the eastbound-side of Rte 119/Tarrytown Rd., White Plains. The street entrance is at the corner of 175 Tarrytown Rd. and opposite the Greenburgh Police Station. Number 5 Prospect, is located in the second business building to your left on the ground floor. What? Me? Boxing? My friends and family little expected my retirement from teaching would involve throwing a decent punch. Wrong. I love boxing! I feel energized after each class. Toni Mafes, our instructor, is forever devising new routines for our workouts. Her caring spirit is infectious and the group is friendly. There are laughs and light moments when we meet. Watch out PD! I notice improvement in my perceived symptoms and I'm making my doctor happy. I was not the exercise-type but now I am a convert. Thank you Rock Steady Boxing! 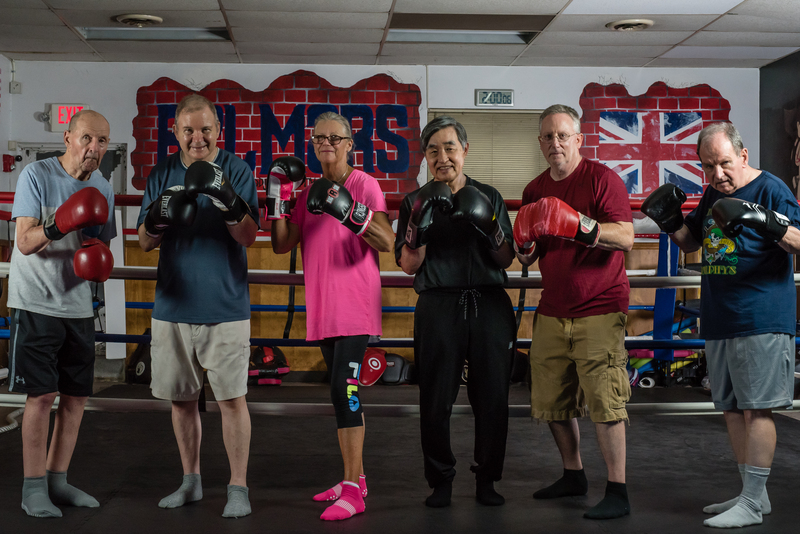 Belmars Rock Steady Boxing program for Parkinson's is a highly focused exercise program for men and women with early or advanced PD. It is lead by a creative and caring instructor whose enthusiasm challenges everyone to fight PD with every muscle in their body. As someone who was apprehensive about my ability to participate in the Rock Steady Program, it has proven to be not only very helpful but also enjoyable. Under the enthusiastic and attentive guidance of Toni Mafes, I am feeling hopeful that continued attendance will strengthen me on many levels. I love Rock Steady Boxing ! Toni, our instructor is awesome. She creates new and interesting exercise for us each week! I always feel energized after a session at Rock Steady. Belmars Gym is in White Plains off eastbound Rte 119/Tarrytown Road. Make a right turn at intersection of Prospect Ave. ~ Opposite the Greenburgh Police Dept. Copyright © 2019 · www.letsfightparkinsons.com. All right reserved.